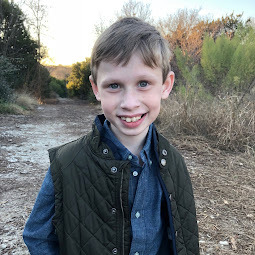 Bennett Brinson Gamel: Fighting Cystic Fibrosis: Surgery is over! The day is done. It's nearly 11pm. Bennett and I are finally tucked into our beds (well, he's in a bed - I'm on a couch). The hospital hallway light accents the darkness in room. 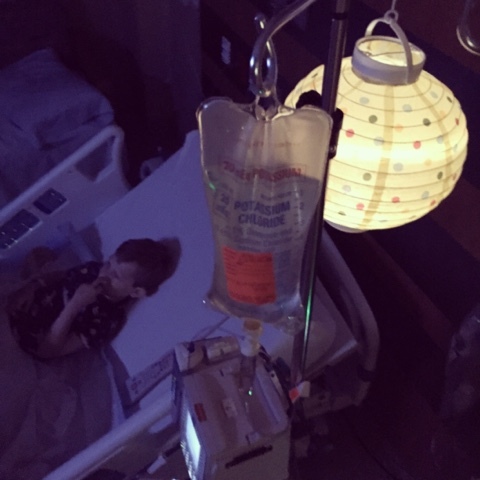 A little battery-powered lamp that I brought is hanging like a nightlight on his IV pole. It's fairly quiet now. 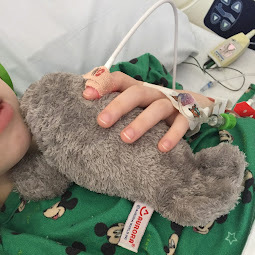 But it's been busy all day since Bennett woke up from surgery late this afternoon. Thankfully, the surgery is done and everything great. 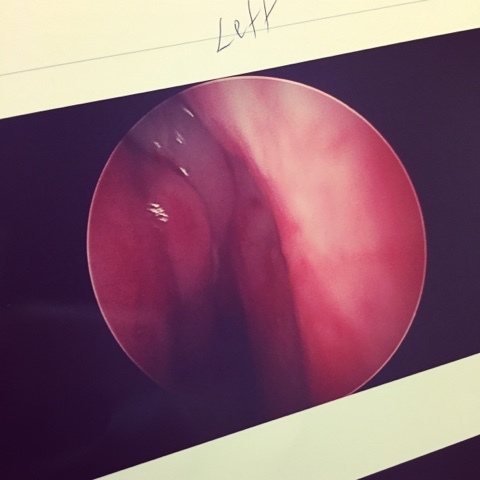 The ENT not only found mucus in Bennett's sinuses but also nasal polyps and puss, particularly blocking his ethmoid sinuses. All have now been cleared out. Unfortunately, nasal polyps are common in CF. 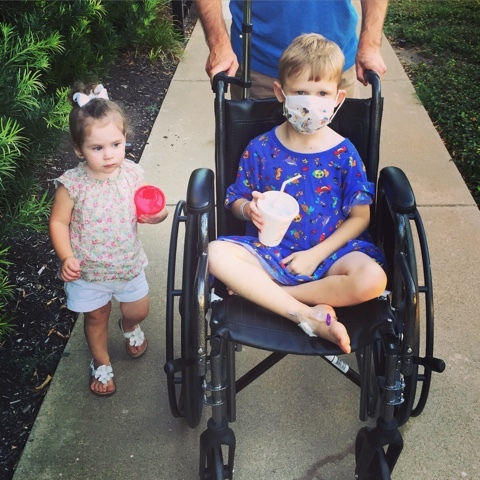 Not all CF patients that have polyps have to have surgery but sometimes, like in Bennett's case, it's necessary to relieve the pain. Nasal polyps are basically swelling of the lining of the nose. They are thought to be caused by allergies, infections or chronic congestion, although exactly why people with CF get nasal polyps are not fully known. They are often characterized by "smooth, pale, almost translucent mucosa on a pedunculated or sessile base", according to the website Medscape. For those CF mamas who have never seen one, here is a picture of one of the polyps they found in Bennett. See that clearish looking thing in the middle top? Weird. The doctor has requested extensive testing on the mucus and tissue she collected today to check on any infections Bennett might have. Bacteria loves to make its home in thick mucus so testing will determine what we do from here with regard to further treatment and antibiotic use. I cannot even express how thankful we are to have gotten this surgery. It's clear he absolutely needed it. 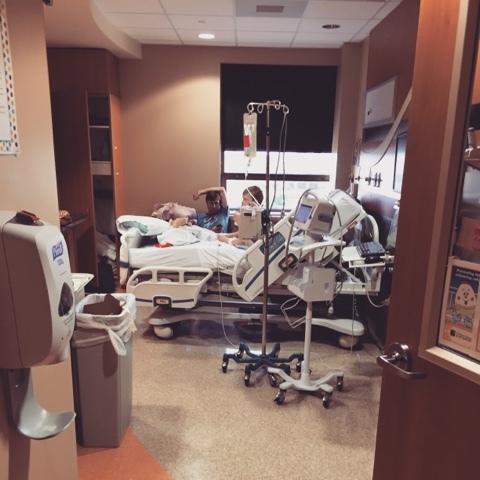 After Bennett woke up from surgery, he was taken to the 4th floor. Shortly after he woke up, Brian returned home to pick up Avonlea and Oliver to bring them back for dinner as a family. We have hospital family tradition of enjoying a meal and some time together as many days as we are in the hospital. 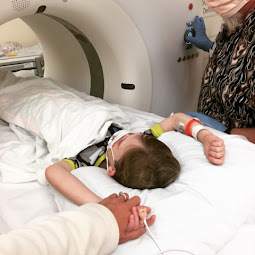 Not only does it allow us to see each other (me with the other kids and daddy with Bennett) but it also gives our non-CF children a chance to see what Bennett goes through. I think it's important that the hospital not be a mythical thing that Bennett visits and then magically returns home from. 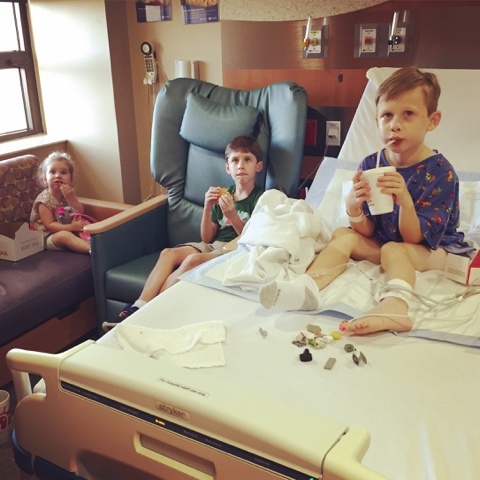 Instead, Brian and I want Oliver and Avonlea to see both the positive and negative things about the hospital and about their brothers experience. 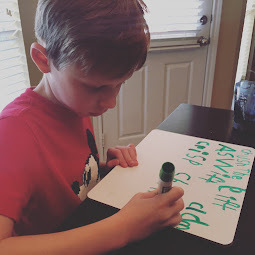 We also know that seeing his siblings is a normalizing experience for Bennett and something that brings him much joy. Avonlea shares her blueberries with Bennett. 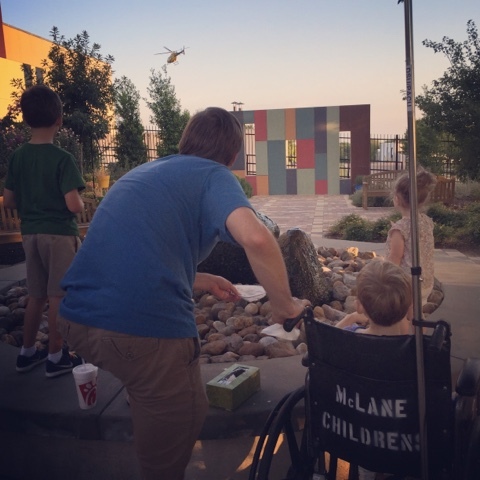 Visiting hours ended at 8pm so for the last 15 minutes of our time together, the five of us went downstairs to visit the Scott and White McLane Children's Hospital's healing garden. There, we were all able to watch a helicopter take off. Oliver enjoyed getting to push Bennett in the wheelchair. 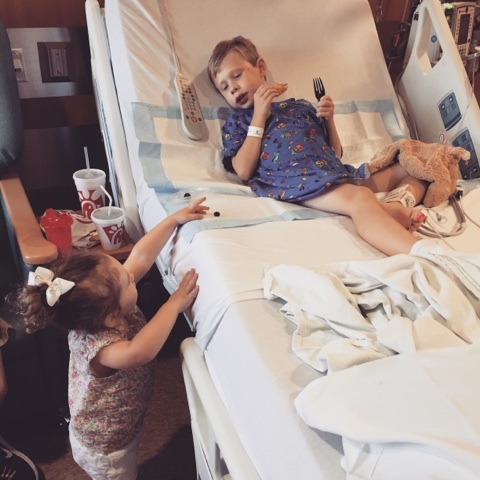 Bennett would have normally been able to walk but during surgery, they weren't able to get the IV to work in his arm. So, they put it in the lower side of his foot instead. Watching a helicopter take off. 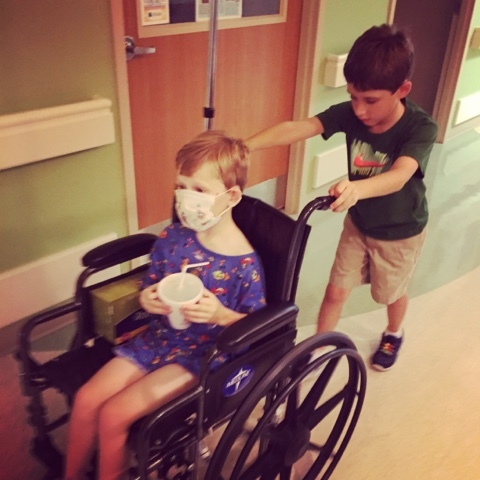 Big brother has fun pushing his brother in a wheelcair. Once we said goodbye and goodnight to Daddy, Oliver and Avonlea, the Respiratory Therapist came in to do treatments. Bennett's nose is still bleeding so we encouraged him to breathe through his mouth, rather than his nose. I began shutting off the lights and preparing Bennett for bedtime to begin after he finished watching the Lego movie he was watching on the hospital TV. But just as the movie was ending, in walked the ENT doctor with two residents with her. Apparently they had just finished in the OR with an emergency. I certainly felt compassion for them. It was obvious they had been working all day. And, of course, they will be the ones in our room at 7am for their morning rounds. The ENT was pleased with how Bennett is doing. She will come check us in the morning and will hopefully discharge us then. I am hoping that Bennett will stay comfortable throughout the night and sleep through any interruptions. He is moderately annoyed with having to sleep with an oximeter on his toe and an IV in his foot. But he is trying to be patient. Tonight, Bennett, surprised that the nurse just comes in and out of the room as she pleases without explicit permission, asked me, "what if a robber comes in our room tonight?" I explained to him that an army of nurses will be awake all night long, sitting at a desk outside of our room. He sat silent. I went on to explain that the nurses, who will be awake all night long, will sleep tomorrow during the day while we are out and about and eating lunch, etc. His mind was blown. And then, a 5 year-old's connection: "Nurses are like owls." Thankful for nocturnal nurses who will keep us from robbers tonight. Goodnight, hospital. See you in the morning. Oh, those hospital nights. And bless the night nurses who stealthy enter and exit without waking sleeping children, and even better tired mamas! Praying you have a quiet night, and an easy discharge in the morning with nothing boring results from the mucus analysis.